Our Wireless Bolt Access Point keeps resetting according to the Uptime. The longest that it has ran is about 3 hours. While the client uptime is accurate from the time we powered it up which has been many days. When this happens we momentarily lose communications. 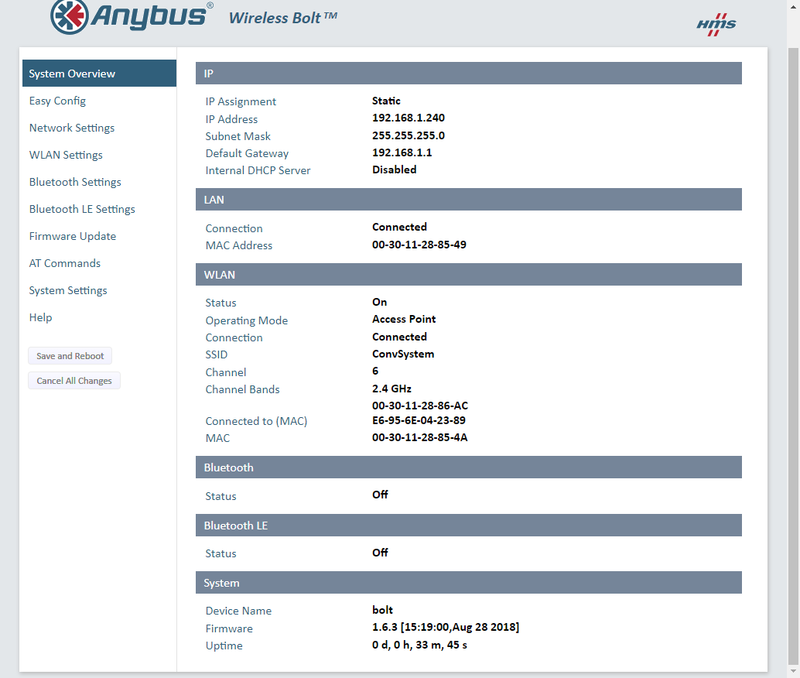 The firmware version is 1.6.3 and it is configured as an access point with one Wireless Bolt Client connected. There are some know stability issues with the Bolt that can cause it to reboot periodically it sounds like you might have your setup in a way that is causing it to occur often. If you provide me with an export of the configuration or a screen shot of the over view page I can try and make suggestions that could help stabilize it. We are also should see a firmware update releasing soon that we expect to help with stability. Attached is a screen shot and the backup file. Thanks for the screenshot, I don’t see anything that I would expect to be causing you stability issues. How much traffic is being sent though this bolt? According to the PLC it is 6-10 packets per second. We just have a Panelview communicating to the Compactlogix PLC. I wouldn’t really expect that to be causing issues. I see in the screenshot that there are multiple devices connected to this AWB it looks like 2 are awb devices and 1 is not. What is the third device? Would you be able to setup the bolts to use the later 2 option? This only works when only bolts are used, it is typically the most stable configuration. The other device was a GL-MT300N-V2 Mini smart router, it is now offline. Is the Layer 2 option setting the devices up using the easy config? We tried that and they set themselves up as a client and an access point but the access point would keep resetting the uptime. does the devices stability change with out the smart router being attached? 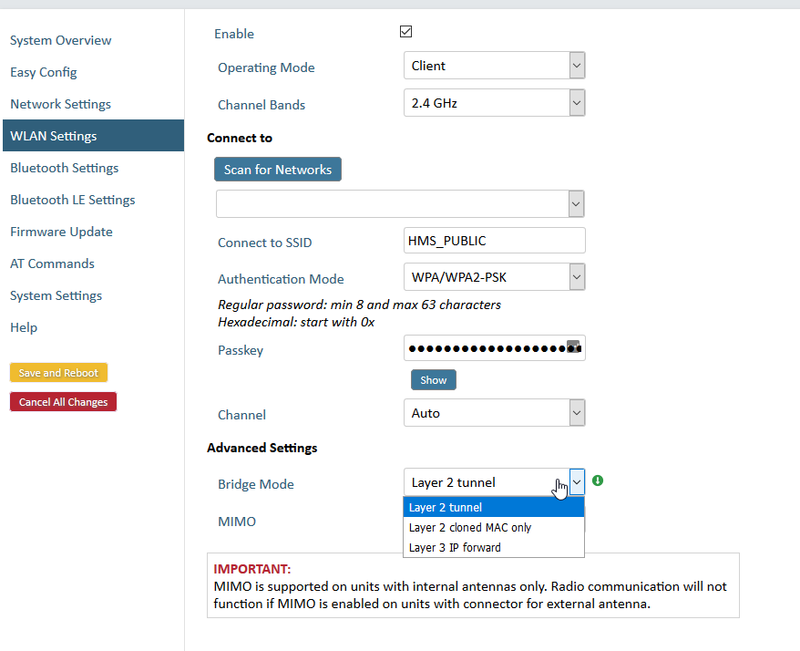 You can either use the easy config option or on the clients you can change the bridge mode to layer 2 tunnel from the WLAN settings page. The stability didn’t change. We took the smart router off the network because we were thinking that it might be causing the issue. I will set the layer 2 tunnel and see what happens. Well It looks like the client was already setup for Layer 2 tunnel. Yesterday I thought I had the smart router powered down but it wasn’t so I totally disconnected it and I haven’t had the Bolt reboot since. Currently the uptime is 1 day and 2 hours. I do get a momentary connection loss once in a while but I think it’s because the client is far away from the access point. I will be moving it closer to see if it makes a difference. Thanks for the update. Let me know if any issues come back and if moving the clients closer helps.